Beautifully engraved specimen certificate of a Good Roads Pay Check printed in 1914. This historic document was printed by Western Bank Note Company and has an ornate border around it with a vignette of two old automobiles traveling down a country road. This item is over 102 years old. "When Road Work Was Welcomed," a story in Old Fox River magazine by editor and publisher Maureen McWaid, details the dawn of the Good Roads Era, when construction was started on the Fox River Trail (Illinois Highway 31) in Kane County. This was the first state-funded concrete road in Illinois. The first strip was laid in front of Mooseheart, just outside Batavia. Concrete was available in the late 1800s, but it was expensive and difficult to install. Instead, a combination of gravel and macadam (crushed stone with a binder) was most commonly used. But hard rains would wash it away and leave huge holes. Kane County, at that time, had the fourth largest population of any county in Illinois, and many of these people had automobiles and demanded that the roads be improved. Mooseheart, which was under construction, offered to pay for the paving work if the state furnished the equipment. Moose members came in from around the country to help. Each worker was issued a union card from the Aurora Building Trades Council. 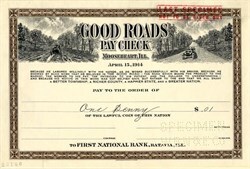 Pay was 1 cent, paid with a Good Roads Pay Check, an honorary certificate issued by the First National Bank of Batavia. The 22-mile stretch from Aurora to Elgin was completed and opened Sept. 29, 1917.